The study and teaching of international human rights law is dominated by the doctrinal method. A wealth of alternative approaches exists, but they tend to be discussed in isolation from one another. This collection focuses on cross-theoretical discussion that brings together an array of different analytical methods and theoretical lenses that can be used for conducting research within the field. As such, it provides a coherent, accessible and diverse account of key theories and methods. 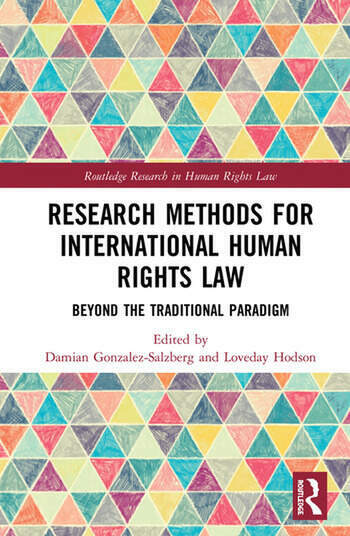 A distinctive feature of this collection is that it adopts a grounded approach to international human rights law, through demonstrating the application of specific research methods to individual case studies. By applying the approach under discussion to a concrete case it is possible to better appreciate the multiple understandings of international human rights law that are missed when the field is only comprehended though the doctrinal method. Furthermore, since every contribution follows the same uniform structure, this allows for fruitful comparison between different approaches to the study of our discipline. Damian Gonzalez-Salzberg is a Lecturer in Law at the University of Sheffield. He has worked as a lawyer in Argentina within the field of human rights and has published extensively on international human rights law in leading international journals, such as Modern Law Review, Human Rights Law Review, American University International Law Review, Northern Ireland Legal Quarterly and Sur – International Journal of Human Rights. He is the author of Sexuality and Transsexuality under the European Convention on Human Rights, recently published by Hart. Loveday Hodson is Associate Professor in Law at the University of Leicester. She has published widely on gender, sexuality and international human rights law. She convened the European Society of International Law’s interest group on Feminism and International Law for a number of years and currently sits on the editorial board of Feminist Legal Studies.